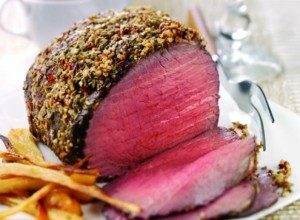 A tasty topside roasting joint with a delicious crust made with crushed fennel seeds, garlic cloves, dried chilli flakes and olive oil. Perfect for all festive occasions or just for a treat! Place the joint on a chopping board and make several slashes over the surface of the joint, taking care not to cut the butcher’s string or elasticated meat bands (if present). Season. In a small bowl mix together the fennel seeds, garlic, chilli flakes and olive oil. Spread the mixture over the surface of the joint. 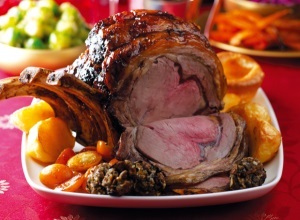 Place the joint on a metal rack in a large roasting tin and open roast for the preferred calculated cooking time, basting occasionally with any meat juices. Remove the joint from the oven, cover and leave to rest for 5-10 minutes. 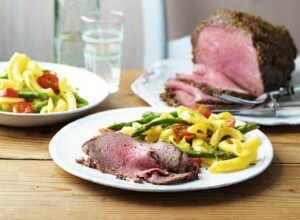 Meanwhile, prepare the gravy, spoon off any excess oil from the tin, leaving about 30ml/2tbsp of any meat juices. Place the roasting tin over a medium heat and sprinkle over the flour. Stir well with a small whisk or spoon, gradually add the stock and wine, and stir again, scraping the base of the pan to release any sediment. 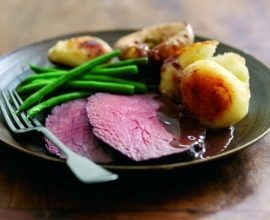 Add any meat juices from the platter, adjust the seasoning, if required and simmer for 8-10 minutes, stirring occasionally or until reduced to a well-flavoured gravy. Strain the gravy before serving. Serve the joint with seasonal vegetables.